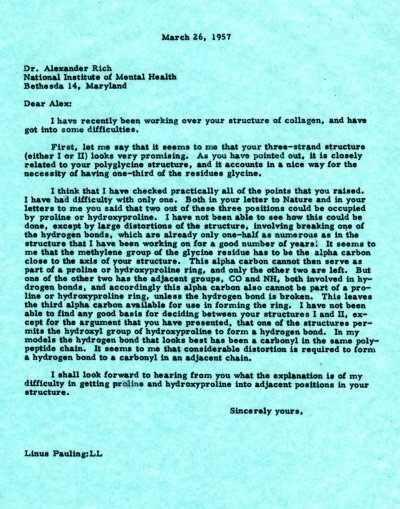 I have recently been working over your structure of collagen, and have got into some difficulties. First, let me say that it seems to me that your three-strand structure (either I or II) looks very promising. As you have pointed out, it is closely related to your polyglycine structure, and it accounts in a nice way for the necessity of having one-third of the residues glycine. I think that I have checked practically all of the points that you raised. I have had difficulty with only one. Both in your letter to Nature and in your letters to me you said that two out of these three positions could be occupied by proline or hydroxyproline. I have not been able to see how this could be done, except by large distortions of the structure, involving breaking one of the hydrogen bonds, which are already only one-half as numerous as in the structure that I have been working on for a good number of years. It seems to me that the methylene group of the glycine residue has to be the alpha carbon close to the axis of your structure. This alpha carbon cannot then serve as part of a proline or hydroxyproline ring, and only the other two are left. But one of the other two has the adjacent groups, CO and NH, both involved in hydrogen bonds, and accordingly this alpha carbon also cannot be part of a proline or hydroxyproline ring, unless the hydrogen bond is broken. This leaves the third alpha carbon available for use in forming the ring. I have not been able to find any good basis for deciding between your structures I and II, except for the argument that you have presented, that one of the structures permits the hydroxyl group of hydroxyproline to form a hydrogen bond. In my models the hydrogen bond that looks best has been a carbonyl in the same polypeptide chain. It seems to me that considerable distortion is required to form a hydrogen bond to a carbonyl in an adjacent chain. I shall look forward to hearing from you what the explanation is of my difficulty in getting proline and hydroxyproline into adjacent positions in your structure.